This smiley brims with sweet appeal. A big smile and hearts aplenty will convey all the sweet emotion you want to express. We have a wide array of images for you to share on Facebook. 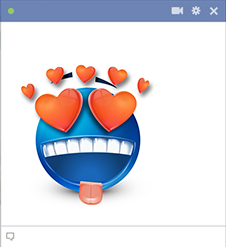 Be sure to set aside time to browse our blue gallery for all kinds of unique smileys to send to family and friends.